A step-by-step wizard guides the user through the setup procedure. The "Read only" option allows you to prevent write access by the program to available Ext2 volumes. This is useful if you wish to secure an Ext2 volume against undesired modifications when running Windows. The "Simple setup" option configures all options for a recent Linux distribution in a convenient way; only drive letters need to be assigned. The "Full custom setup" option lets you configure the software for specific needs. Full custom setup. Choose whether you want to use UTF-8 encoding. Note that all recent Linux distributions use UTF-8 encoding. If this option is not enabled, the Ext2 driver will use the current Windows OEM code page. Full custom setup. You have to decide whether you want to enable the large file feature, which allows files larger than 2 GBytes. (Please read the FAQ section, too.) If you have a recent Linux distribution you should enable the large file feature. Full custom setup. You have to decide whether you want to enable the huge file feature, which allows files larger than 2 TBytes. (Please refer to the the FAQ section for further information.) If in doubt, you should disable the huge file feature. Full custom setup. You have to decide whether you want to enable the dir-nlink feature. It is for 65000 or more subdirectories within a directory. (Please read the FAQ section, too.) If in doubt, you should disable the dir-nlink feature. Finally the wizard allows you to assign drive letters to the Ext2 volumes. A partition scheme of all hard disks of the computer is shown. If you want to configure drive letters at a later stage you may use the "IFS Drives" item, which is now included on the control panel. The "IFS Drives" item installed on the control panel allows you to maintain drive letters of Ext2 volumes very similar to the setup wizard. "Automatically assign drive letter when connecting a device for the first time". This option decides what happens when a device, e.g. an external USB hard disk drive, is plugged in for the first time (after installation of the Ext2 IFS 1.12 software): When this feature is enabled, drive letters are created for all (non-Windows) partitions of the device. Otherwise you have to create drive letters manually in the "IFS Drives" item on the control panel, but only once initially. Here we have a Windows which runs with one paging file at an Ext2 volume only. 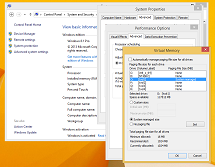 If you do not have enough space on FAT or NTFS volumes, you may use Ext2 volumes instead. Windows Server 2008 R2 for "Itanium Based Systems". 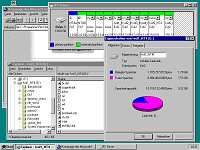 It was the last Windows Version for the Intel Itanium.